Take your favor packaging from drab to fab with a diamond-shaped customized wedding favor sticker! With endless combinations of designs and wording, you can create a label that is truly one of a kind. The 1.9" x 1.9" diamond shaped label is personalized with 3 lines of custom text. Choose from one of our unique designs that represent destinations, seasons and more! 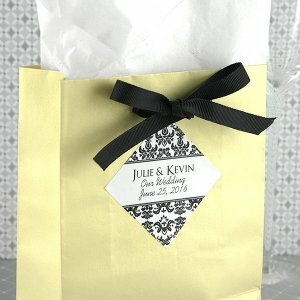 It's a great way to add a personal touch to your favor boxes, favor bags or anything else you can imagine. Sold in sets of 20. Minimum of 2 sets required.